The day started with Farmer pulling “my daughter is at the dentist” excuse. Now in fairness to Steve he has beautiful twin daughters. But this is the 22nd time he has used the daughter at the dentist excuse (henceforth known as excuse number 22) this season. To anyone believing this excuse is genuine, it may be a good time to invest in Dentistry shares. But more excuses later. I noticed that Le phantom friskier had arrived late, so anyone who had turned up expecting a pat down were sorely disappointed. Having made my way down to the dock, I was confronted by Dai and two unknown volunteers wearing matching cowboy hats who clearly did not understand the murky underworld they were letting themselves in for. Steve slipped over quietly and whispered to me that Kermit had been ‘fixed up for me’ and was ready to race. More observant bystanders noted that said vessel was in fact still on the hard (to quote a nautical term). Dai looked on in horror as The two Cowboys led me to an insipid craft called ‘This way up’ or something along those lines. Despite winking at them etc, no attempt was made to pass me any contraband, oars, outboards, etc. What a waste of £3 I thought to myself. As the mediocre craft slid out into the lakes two sounds caught my attention. I could clearly hear the two Cowboys shouting Die Die (editors note, we suspect they were saying Dai). Secondly I could hear Fay telling Karen that Bob had been ” tucked up”, and to adjust the odds accordingly. Shortly afterwards I was approached by a very fidgety Mike Blatchford who appeared to be sitting on a nest of ants. “Take a look at the other Martin” Mike advised me. I looked across at the other Martin and spotted the unlikely alliance of Andy (ram anyone who gets in the way) with none other than the Northern Cardinal himself, Peter Gregory. In the past we have had such great partnerships as Rodgers and Hammerstein, Morecombe and Wise and the Krankies. This partnership however struck me as more like Delboy and Rodney, it was either doomed to failure or this time next year they will be millionaires. True to form Kim came sliding out of the reeds in none other than the Red Rocket, which is strangely absent each time I approach the dock. I had strategically placed sellotape on my lips so I wouldn’t ask how Kim was feeling. Once again the gentlemen within me took control and I spluttered through a mouthful of sellotape ” how are you Kim”. “Terrible, worse than ever” Kim replied. William Hill and Ladbrokes immediately cut their odds from five to 2 to evens favourite, but strong money was also being placed on the fools and horses duo. Mike Blatchford however now appeared to be attempting to abandon ship and had rapidly gone out to 20 to one, very good odds for a previous course and distance winner. With all this activity taking place, the two evil 2.4’s were also looking good value for money. As usual the normal game of Chinese whispers was taking place at the start. Was it D,A,C or C, A, D. At this stage I always feel a little sorry for Mark C ( the person not the buoy). Many a time I have seen him and his crew set off followed by a small flotilla who misunderstood the Mark C connection. As Usual Bligh set off in the Bounty and took a huge starboard tack. The double handed 303’s were next and most made a good start. Finally it was our turn and my insipid craft went off like a rocket, leaving Kim and the well fancied Red Rocket in my wake. It is now that sadly I have to report two very unsporting moments that clearly affected the race result. I could almost sense the victory line (O K we had just started), when I heard the unmistakable screaming of a woman in distress. It was clearly Kim and judging by the noise of her screams she had either lost a limb in an accident or was clearly in need of an ambulance for some other disaster. I tried to signal the control boat to dial 999 and call out the coastguard, but they were busy sunbathing (OK l exaggerate a little). I have to admit I was torn, this was my chance to leave Kim miles behind, but my conscience got the better of me and several other vessels who scrambled to the clearly stricken Kim. I had by this time built up an unassailable lead (OK it was 10 foot) and had to choose between Kim’s life and victory. It was a hard decision to make, but then I remembered Kim telling me that her cat had once saved her life and was her hero. So it was a straight decision, victory or hero? The thought of appearing on the news proved too much and the insipid one diverted course on a rescue mission. As I crossed the huge 10 foot gap between us, I could just distinguish what she was yelling like a drunken banshee ” SPIDER, SPIDER”. Hmm I thought as I swung around once again, “wonder where the other one is”. Of course by now Kim had regained her composure and shot by while I retrieved my anchor. As I tracked down Kim bent on revenge a second dodgy event occurred. I could see Kim calling over the control boat and pointing at the insipid one. The control boat then swung over to me and informed me that my outrider was miss functioning. How could I possibly have a faulty outrider when I didn’t even know I had one. Anyway suffice to say I was in the pits for what seemed like 15 minutes and I couldn’t help notice a very happy looking Kim as she disappeared over the horizon. Never mind I thought the 2nd tarantula is yet to make his debut.. The insipid one continued to punch well above its weight and as the half hour mark approached, none of the faster craft from the posh dock had passed me. I was busy shouting at the race officials pointing at my watch when suddenly the Trotters shot by, closely followed by David in one of the evil 2.4’s. But Mike fidgety Blatchford and Peter in the other evil 2.4 remained behind. Suddenly the wind dropped off and I was able to consolidate a mid table finish, comfortable in the knowledge that if it hadn’t been for some outrageous match fixing, it would have been an entirely different finish. Mike Blatchford approached me at the end and claimed he had been sabotaged by a broken seat in the Martin (excuse number 34) and Peter in the 2.4 was claiming lack of practise having not attended for a few weeks. Pippa was able to confirm that Jimmy’s training was going well, although he appeared to be helping himself to her lunch when she looked the other way. An added bonus was the hot Panini’s being served, which I can confirm were very good and well received. The standard of sailing is definitely improving and I tip my cap ( if I had one) to the double handed crews including Fay, Mark C and Daljit, who left me miles behind. Despite, sabotage, shady goings on and arachnids, another very enjoyable day at Chipstead. Many thanks to all the volunteers , including the Cowboys, Dai, and the dodgy pit crew. 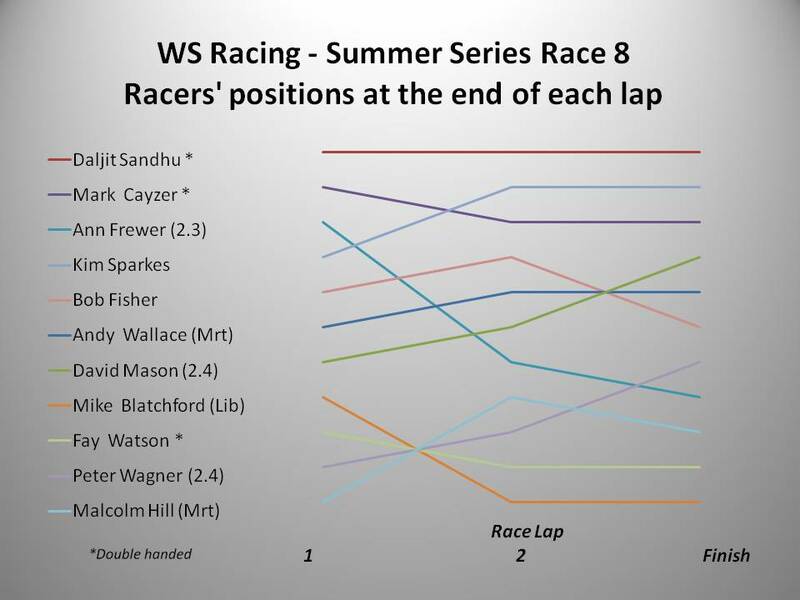 Sanjit Sandhu; 2.Kim Sparkes; 3. Mark Cayzer; 4. David Mason; 5. Andy Wallace; 6. Bob Fisher; 7. Peter Wagner; 8. Ann Frewer; 9. Malcolm Hill; 10. Fay Watson; 11. Mike Blatchford. I admit, I made a tactical mistake at the start, but at least I beat the RS Venture! Just back from my wanderings in Mallorca and The Solent and reading this report has made me realise how much enjoyment I have to give up when missing a WS Race Day! Thanks for making me laugh again Bob and for keeping me in the picture about the various goings-on during my absence. No doubt The Trustee was po-faced throughout the boat allocation process!! But I do hope our superb Fleet Reporter will reconsider any thought of retirement when there are clearly so many more brilliant observations, and ensuing laughs, in his pen! !